Allama Iqbal International Airport serves Lahore, the capital of Pakistan’s Punjab province. The airport is the second largest in Pakistan and in addition to an International Terminal, it is also home to a Hajj Terminal, used only during the Hajj season for the departure of dedicated Hajj flights. This Allama Iqbal International Airport guide provides you with information regarding the airport terminal, airport contact details and hotel recommendations. There are information desks located in the Arrivals lounge, the Departure lounge and the main concourse hall. From Lahore city centre, drive along All-Ud-Din Road before turning right onto Aziz Bhatti Road. Continue onto Amjad Chauhdry Road and then follow Airport Road until you reach Allama Iqbal International Airport. Drive time is approximately 35 minutes. Allama Iqbal International Airport is located approximately 15km (9 miles) from the city of Lahore, Pakistan. Coaches and buses leave regularly for the city. Taxi services to the city are also available (journey time - 20 minutes). Coach: There are local buses available at Allama Iqbal International Airport. These buses (Route B-08 and Route B-28) can take you into the city of Lahore. Taxi: There are two taxi companies at Allama Iqbal International Airport: Metro Radio Cab (tel: +92 42 111 222 787) and City Radio Cab (tel: +92 21 111 11 1129). ATMs can be found in the terminal. There are also currency exchange counters located in the International Departure area, the International Arrival lounge and the main concourse hall. Several banks are also represented in the terminal. There is a restaurant located on the second floor of the main terminal and one can also be found in the International and Domestic Departure lounge. There is also a snack bar in the International and Domestic Departure lounge. Allama Iqbal International Airport offers duty free shopping as well as bookshops, toyshops and a number of souvenir shops. A lost and found service is available within the terminal. Allama Iqbal International Airport has prayer rooms, first aid facilities, a luggage porter service, and a Business Lounge. There are no conference or business facilities at Allama Iqbal International Airport. You can access excellent conference facilities at The Nishat Hotel (tel: +92 111 000 777; gulberg.nishathotels.com/), which is an approximate 40-minute drive away. Free Wi-Fi services are available in all lounges. A post office can be found in the terminal building, near the Domestic Arrivals hall. Signposted facilities are available for disabled/elderly passengers. A wheelchair service is also available. For more specialised assistance, contact the airport (tel: +92 42 990 31000) or your airline directly. 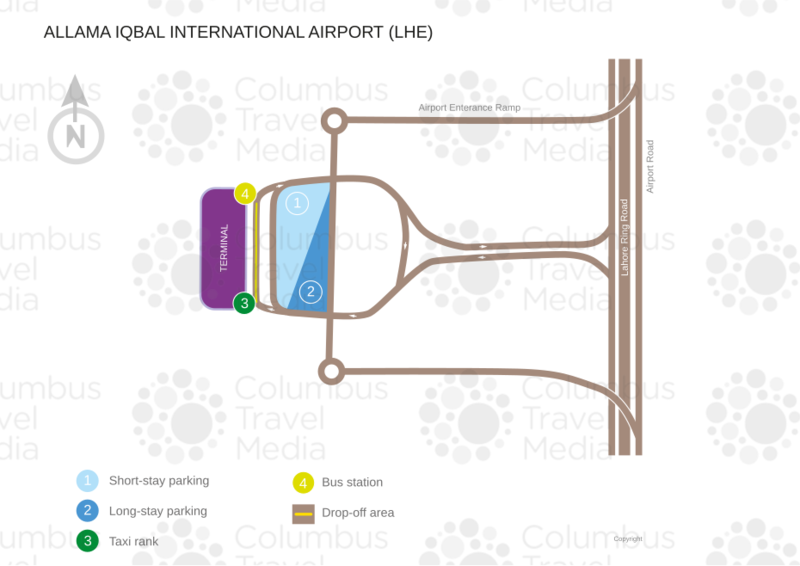 Car parking facilities can be found in front of the terminal building. Avis and Europcar are car hire companies that can be found at Allama Iqbal International Airport.